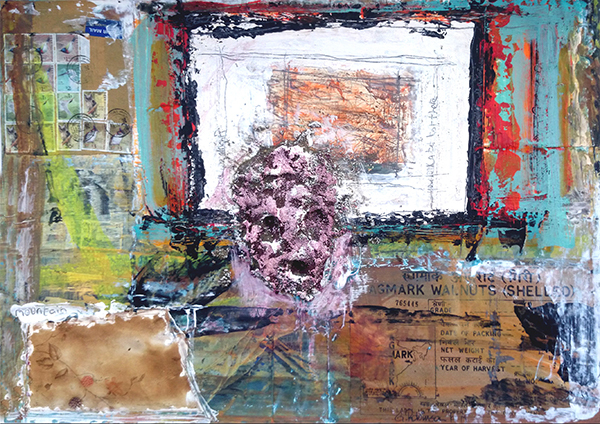 John Kingerlee says he recognizes “the real artist” when he sees the work of the younger painter – the one who thinks less of the art market and mor of the artwork itself. Longford artist Gary Robinson who sought John out in County Cork believes he has an affinity with Kingerlee whilst the master John believes they are influenced by each other and “everything we look at”. Both artists are seen to engage with Nature in a multi-sensory experience in tune with what is happening around them. In the tradition of Raushenberg (1925-2008) who wove everyday bits and pieces with oil, metal, fabric, collected mementos, etc. Hohn “manufactures” his truly original assemblages from his hoarding of the traces of his life and journeys (eg. Small Walks in Prague) postage stamps that people throw away achieve importance when juxtaposed with other elements of collage and found material. These diaristic works are a form of storytelling from his wanderings and in that way he says he is reenergized by the young Robinson’s intimate journal of his own day to day cognisance.